It takes something special to be welcomed into the unicorn fold. You simply can't be basic. You have to flaunt your creative, magical side. You don't order a simple black coffee at your local shop. Your morning beverage has twists and swirls. It tastes like dreams come true and misty morning meadows. Looking for a unicorn family can be tricky if you don't know what you're looking for. The horned creatures don't just appear in the city, trotting down Main Street. You have to look for sparkles at the corners of your eyes, follow those sparkles, and who knows where you'll end up. Maybe there will be a silver forest in the subway. Maybe the neighborhood taco spot will be hiding a secret misty meadow behind the back booth. Or hey, maybe you'll just have to keep that sparkle alive and create your own magic where you live! The other magical folks might just be seeking you out! 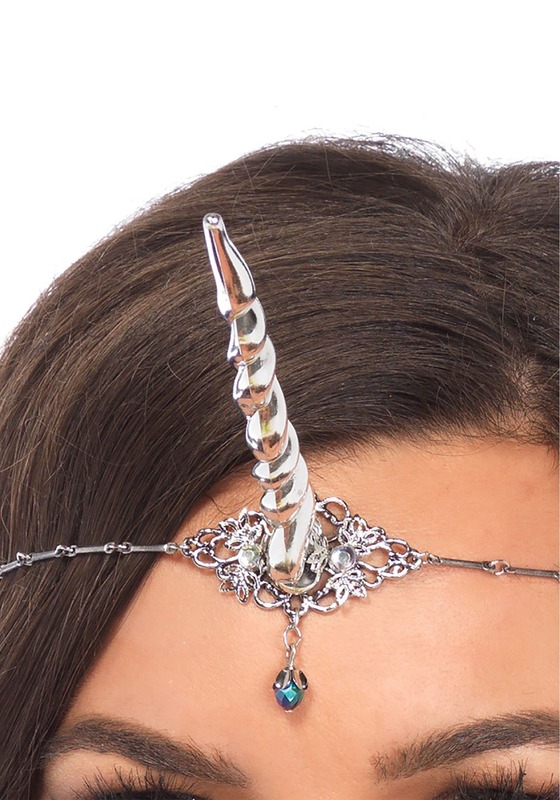 This small and sweet unicorn horn is mounted on a pretty circlet. The mount is swirling with leaves and jewels to make you feel right at home in that magical mountain kingdom. This unicorn horn will take both Halloween costumes and going-out ensembles to the next level. Pair it with a dramatic wig as pictured and sparkly makeup and you'll be ready to embrace your magical inner self!